What is ADETs Level of Certification and Recognition? ADET Inc. is proud to be working in partnership with AED manufacturers around the world, leaders in medical technology, to offer PAD (Public Access Defibrillation) Training. In June 2001, our program also received accreditation as an endorsed agency for AED Training through Sunnybrook Base Hospital. Below outlines information pertaining to our program, legislative policies, certification requirements and program intent. Defibrillation is the therapeutic use of electric current delivered in increasing amounts over very brief periods of time. The effectiveness of early and rapid Defibrillation and its effect on cardiac arrest is well documented and its application has become one of the primary links in the "Chain of Survival". Defibrillation has gained such widespread acceptance that the principal regulatory bodies, such as the American Heart Association, the Heart and Stroke Foundation of Canada, and the Ontario Ministry of Health, are promoting its movement into the community and its use by non-EMS (Emergency Medical Services) personnel. What follows is a summary description of the program for the training and certification for you and you group in rapid Defibrillation. How Can We Provide Defibrillation Training? Our AED program currently meets and exceeds the training requirements as outlined under the Regional Base Hospital P.A.D. Program. CPR certification is mandatory and must be current within six months of the Defibrillation course or be included in the Defibrillation Training. Our Defibrillation program is usually a 3 ½ hours program. The Defibrillation Refresher program, completed annually, lasts 2 hours in length. 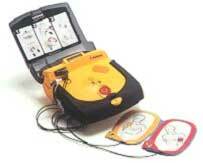 What Is Included In Our AED Training Program? Along with our exceptional training experience and program delivery, a thorough review of existing Emergency Response Protocol(s) will be provided, with written feedback and documentation outlining suggestions which may enhance and improve response times, safety at the scene and in the environment and overall care to the patient. This service, which may be requested prior to training, is included in all of our AED Provider Training programs. Our review is offered in conjunction with our emergency care education and provided by both the President and AED Program Director, and other Emergency Field Personnel at ADET. There is no cost associated with this service as we believe any program, including basic First Aid, must identify personnel and implement site-specific emergency response policies to effectively utilize both equipment and skills acquired in our training. As part of our Continuous Quality Improvement process, including Emergency Response Protocol, we will ensure that proper procedures are in place to allow excellence in the performance of First Aid, CPR and the controlled act of defibrillation as well as ensure the safety of the public when these acts are performed. An internal AED Provider Program committee, task force or group to assist in the direction for continuing education, implementation and ongoing maintenance of the AED program. The insurance of an internal Emergency Response Protocol. This will include a plan of action at each site, which serves to activate the local 911 response and the internal First Response/AED Provider response. It will provide for the access, co-ordination, management and immediate care of the victims of cardiac arrest in a safe and controlled emergency situation/environment. Where an Emergency Response Protocol in already in place, ADET will further suggestions for the implementation of and the application of the AED as per current policies and offer changes or improvements to better time, safety and care during an emergency. Provisions and conditions will be put in place to allow for the certification of AED Providers. An AED maintenance program will be put in place to continually ensure that the AED is ready for use. This will include the process of documented monthly AED and related equipment checks. A liaison will also be put into place to allow for mandatory and scheduled AED maintenance and servicing with consistent communication and feedback to ADET. A quality management program will be put in place to perform case-by-case review of each AED application including information stored on the AED and clinical information recorded by the AED provider. ADET as well as sharing of clinical information with the Regional Base Hospital for the EMS system involved, will put a clinical information management program into place to ensure adequate storage and use of the information. The program will aid in the process of critical incident stress debriefing for AED providers and family members of employees who suffer a cardiac arrest. This will occur through the availability of ADET to explain the medical aspects of the cardiac arrest to the AED Provider, patient and their respective family if necessary. This is made to support any counseling already provided by your employer. Yearly re-certification of AED and CPR Training is required to be refreshed on an annual basis. 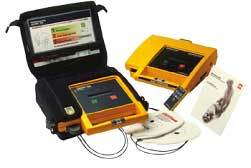 ADET offers, at no additional charge, a 6 month AED Providers review for those previously certified. Our alliance with AED manufacturers allows us the ability to provide for all aspects of program implementation; from program discussion and evaluation, to training and certification, and to selection and purchase of various machines. Test your skills in defibrillation, click here to download our PAD Demo. Website Maintenance by Fusion Studios Inc.